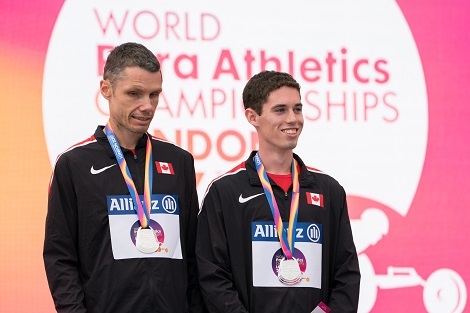 Jason Dunkerley (MA ’14) collected another world-class medal and memory after winning silver in the men’s 1,500-metre T11 race at the World Para Athletics Championships in London on July 21. He and new guide Jérémie Venne crossed the finish line in four minutes 13.67 seconds, just over two seconds behind Kenyan gold medallist Samwel Kimani. Dunkerley’s feat is all the more remarkable considering that he was supposed to have retired. After the 2016 Paralympics in Rio, where he placed fifth, he said his days of international competition were over. Dunkerley is one of very few athletes to return to high-level competition after donating a kidney. He has lived with a single kidney since donating the other to his then-wife in 2013. A veteran athlete with six world championship medals under his belt, Dunkerley recently earned another honour. He has been invited to represent North American athletes on a new World Para Athletics advisory committee. 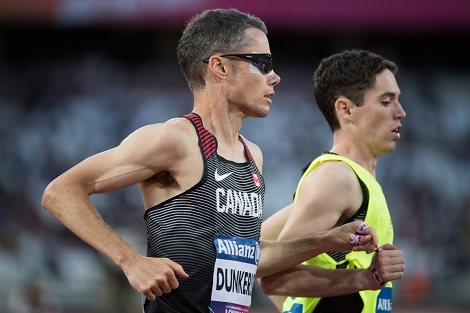 Born in Northern Ireland, Dunkerley moved with his family to Canada when he was 13. His parents encouraged their three sons, all born blind, to be just like other children, playing outside, riding their bikes and playing soccer. Dunkerley, who works for the federal government as a junior analyst with Innovation, Science and Economic Development Canada, came to uOttawa as a mature student, at age 36. He completed a master’s in World Literatures and Cultures at the Faculty of Arts. He also received “great support” from Access Service, the University office that seeks to level the academic playing field for students with temporary or permanent disabilities. “Staff were always very personable and accommodating,” he said.